Hola chic@s este Book Tag que os traemos hoy consiste en elegir un libro para cada ingrediente de la hamburguesa siguiendo los pasos que se indican. ¡Esperamos que sea de vuestro agrado y que lo disfrutéis! Hi girls this Book Tag consists in choosing a book for each ingredient of the burger following the next steps. 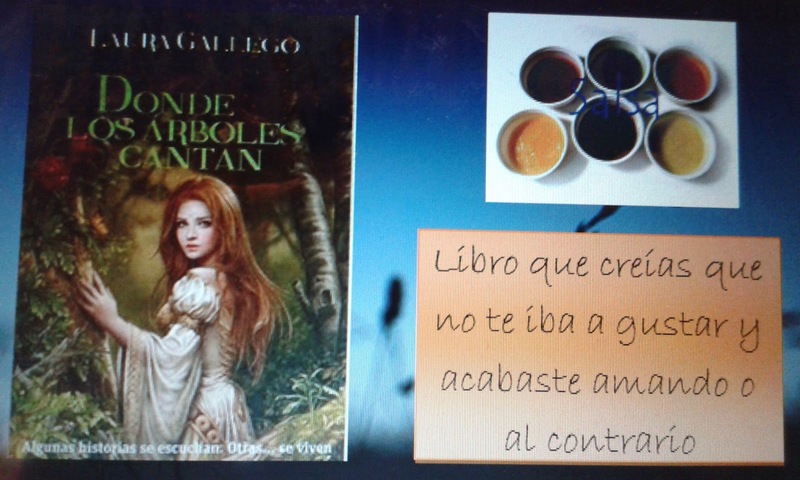 ¡We hope you like it! The first book of a collection that you love. 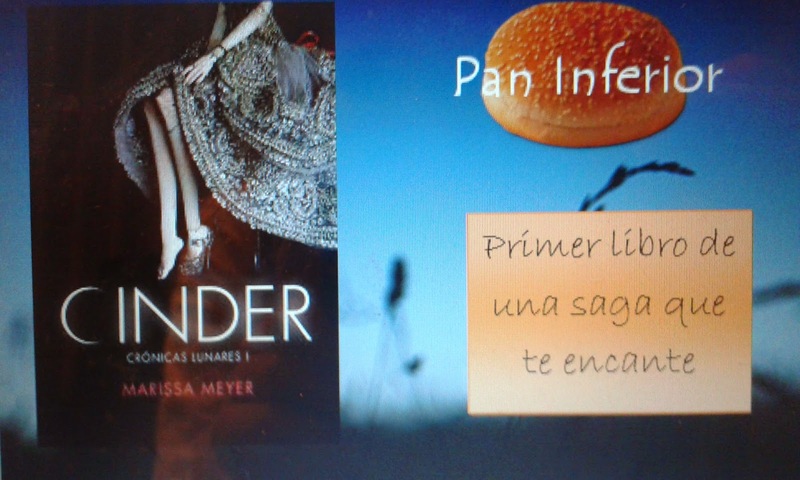 Cinder es el primer libro de la saga cronicas lunares y aunque por ahora solo me he leído este ya me ha gustado desde el principio. Cinder is the first book of the collection "The lunar chronicles" and I just have read this one but I have liked it from the beggining. A book you haven't read but you want to. 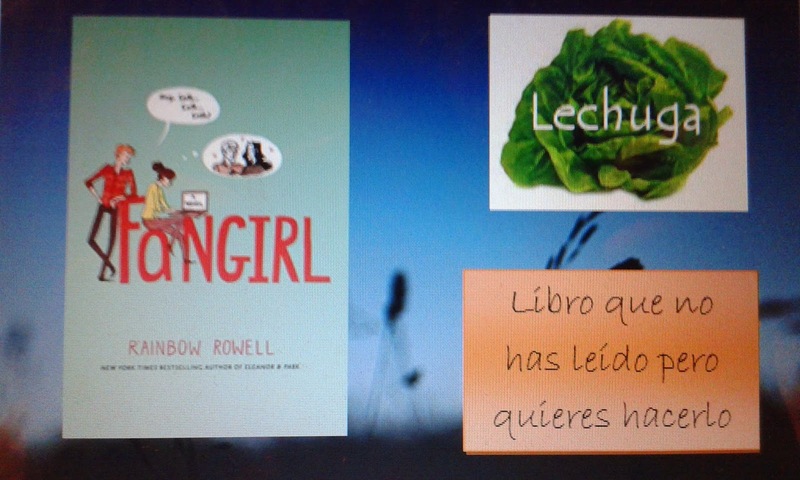 Un dia estaba buscando nuevos libros para leer y encontre a una autora que no me sonaba de nada (Rainbow Rowell) así que la investigue un poco y encontre este libro: Fangirl. Aún no lo he conseguido pero tengo muchas ganas de conseguirlo. One day I was searching new books to read and I saw a writer that I never heard about (Rainbow Rowell) so I searched something about her and I found this book: Fangirl. I haven't read it yet but I want to read it. A book with 200-400 pages you love or hate. 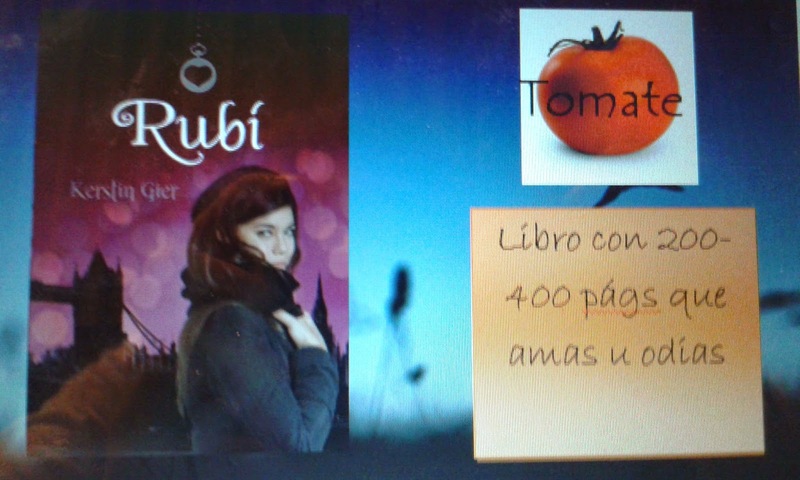 Mi tomate no podia ser otro que Rubí de Kerstin Gier este libro me robo el corazon y por eso tambien le he dedicado la primera reseña de este blog. My tomatoe it had to be Ruby by Kerstin Gier this book stole my heart and because of that I decided to talk about it in my first review. A book with 400 pages or more that you have loved. 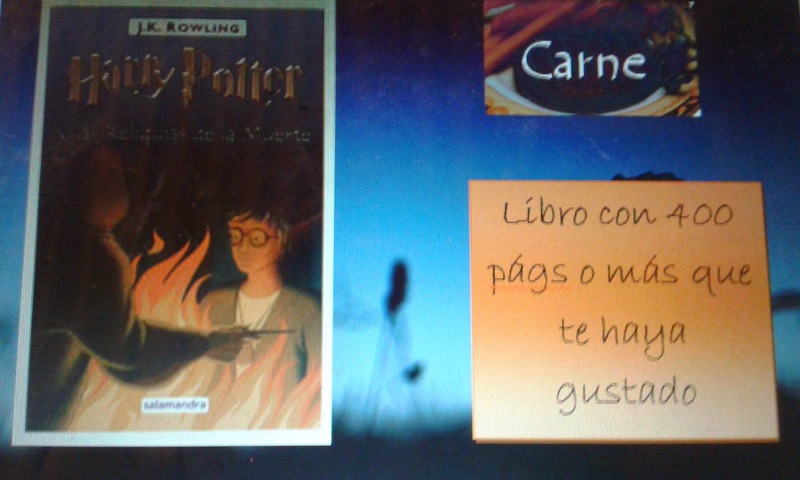 Harry Potter y las reliquias de la muerte es mi libro favorito de la saga de HP porque en el se aclaran todas las preguntas (o casi todas) y ademas esta escrito por una de mis autoras predilectas: J.K.Rowling. Harry Potter and deathly hallows is my favourite book of the Harry Potter's collection because they answer all the questions and it's written by one of my favourite writers: J.K.Rowling. A book you thought you wouldn't like but you finally loved them or conversly. Cuando lo empece a leer no me gusto demasiado ya que no tenia demasiada accion pero conforme fui avanzando en la lectura vi que la protagonista es una chica fuerte y decidida. Me fui enganchando hasta que llego el esperado fin de la historia. When I started reading I didn't like it so much because it didn't had some action but I still read it because later I saw that main character was a strong girl. A book with 200-300 pages that you have read and you have enfoyed it. 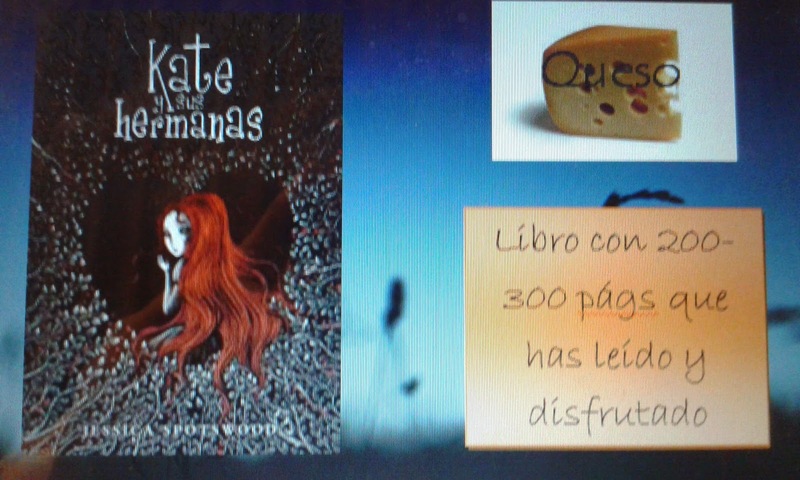 Kate y sus hermanas me encantó es un libro maravilloso de Jessica Spotswood. Si os gusta la literatura juvenil y fantastica os recomiendo este libro porque a mi me encanto.Tiene más de 300 paginas pero no podia consentir que este libro quedara fuera del book tag. Kate and her sisters it's a book that i've loved, it's by Jessica Spotswood. If you like the teenage and fantastic literature I recomend you this book. It has more than 300 pages but I couldn't leave this book out of the book tag. Last book of a collection that you are afraid of. 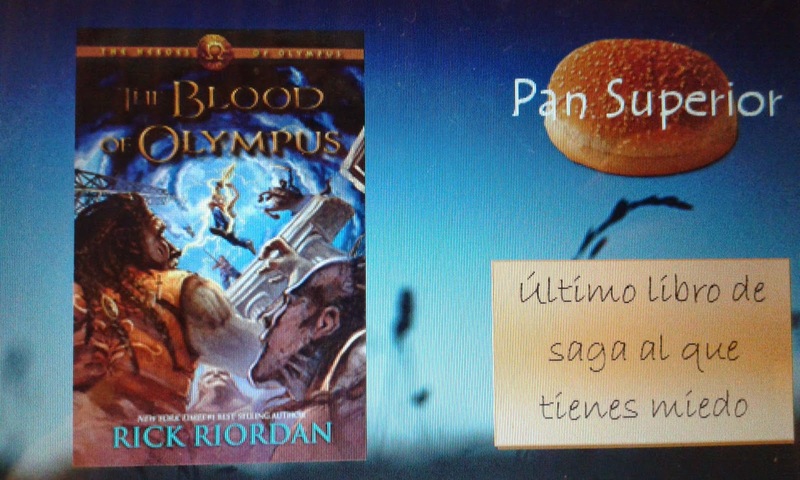 Los heroes del Olimpo es la saga que continua con el ultimo libro de Percy Jackson y La sangre del Olimpo es su ultimo libro al que le tengo mucho miedo porque he leido comentarios que dicen que mueren todos los protagonistas, otros que por el contrario explican que no muere ni uno y algunos otros que mencionan que solo viviran dos. Así que le tengo mucho miedo al libro por lo que pueda pasar. The Blood of Olympus is the last book of the Percy Jackson's collection with the other one called "The heroes of Olympus" and I am afraid of that one because some people say that all the main characters die, or other ones who say that it doesn't die anybody, and some other ones that say that it only survives two characters. So I'm terryfied of that book for what is going to happen. ¿Estais de acuerdo con algún ingrediente? ¿Habeis leido alguno de estos libros? ¿Que os ha parecido? ¿Do you agree with some ingredient? ¿Have you read some of those books? ¿What do you think?